If you’ve just discovered you need dentures, it’s normal to be nervous and not know what to expect. Major physical changes are always a challenge, and your ability to smile, talk, and eat normally has a huge impact on your self-esteem. Adjusting to life with full or partial dentures can be a challenge, but you’re not alone. Many people over 40 are missing teeth and require partial or full dentures to restore normal tooth function and appearance. To help ease the transition, here are a few tips for adjusting to a great new life with your functional, affordable quality dentures. At first, you may find it difficult to pronounce certain words. With practice, it will get easier. Read out loud when you are alone, and repeat problem words until you feel more confident. If you experience denture clicking while talking, speak slowly. 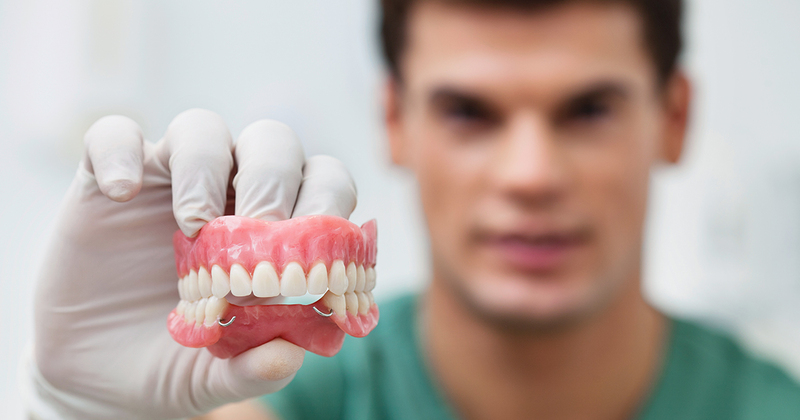 Dentures may feel loose or awkward in your mouth until you get accustomed to them. The muscles in your tongue and cheek must learn to keep the appliance in place; this process will occur naturally over time. During the adjustment period, using a small amount of denture adhesive can help stabilize your dentures and prevent embarrassing accidents. Your dentures may shift or slip when you cough, laugh, or smile. You can reposition them discreetly by biting down gently and swallowing. If the problem occurs frequently or makes you feel self-conscious, use denture adhesive to prevent slips. Your dentist or prosthodontist can help you with virtually any problem related to your partial or full dentures. If you experience continued discomfort or problems with eating, speaking, or denture maintenance, don’t be afraid to ask for advice. Your full or partial dentures are designed to improve your quality of life, and your dental team will be happy to make sure that they do.